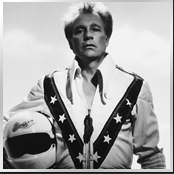 Rest in peace, Evel Knievel. and brought glory to America. Boom. Splat. Boom. Splat. Boom. Splat. They’d call you Microsoft. Or Windows. rolled-up newspapers doused in gasoline. Flames leapt eight feet into the air. I joined my school’s electronics club. » Show me the VHS!